I had a vague recollection of having posted a '64 big Chrysler in this series, but it turned out to be a DOTS Oakland Edition '64 Newport. 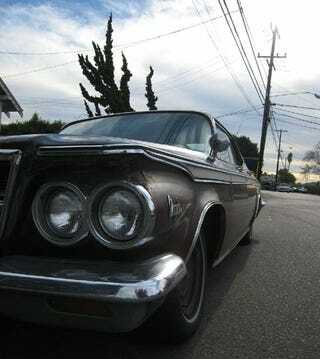 So let's cross the Estuary from Oakland back to Alameda and scrutinize an oxidized-but-highly-original '64 Chrysler 300 today. This four-door hardtop, which lives in the vicinity of the '72 Capri, has survived many, many miles and yet still serves as everyday transportation. The standard engine in the '64 300 was a 305-horse 383 V8. Of course, by this time the car might have had a 440 or 413 swap- you just never know with mix-n-match-friendly 60s Detroit cars. No focus group would ever permit an automaker to have such a grille as this today; focus groups want bigger cupholders and a higher driver's seat, not vivid styling. I like the "textured" paint, but those wheelwells deserved to be filled up by bigger tires.